Def Leppard knocks out "Love Bites" at Spokane Arena Wednesday. Anyone who wants to chalk up Def Leppard's ongoing success simply to nostalgia for the band's '80s and early '90s commercial heyday should probably ask themselves why most of the band's peers from that era aren't also consistently selling out arenas and amphitheaters in 2015. The British rockers were a cut above from the very beginning of their career, crafting anthems full of killer hooks and impressive harmonies that stayed a part of their songwriting as they shifted from being an up-and-coming part of the so-called "New Wave of British Heavy Metal" to a pop-rock machine embraced by the mainstream with chart-topping albums like 1983's Pyromania, 1997's Hysteria and 1992's Adrenalize. Yes, the band's concerts still lean heavily on those golden years of monster hit singles, but the songs for the most part sound timeless and alive, rather than simply aural museum pieces hearkening the good old days. At the Spokane Arena Wednesday night, the guys in the band might have looked a little older, but the rocking songs still hit hard, the ballads still soared, and the crowd filling the place to the rafters sang along nonstop as they were treated to a great night out. It's hard to imagine anyone went home complaining. 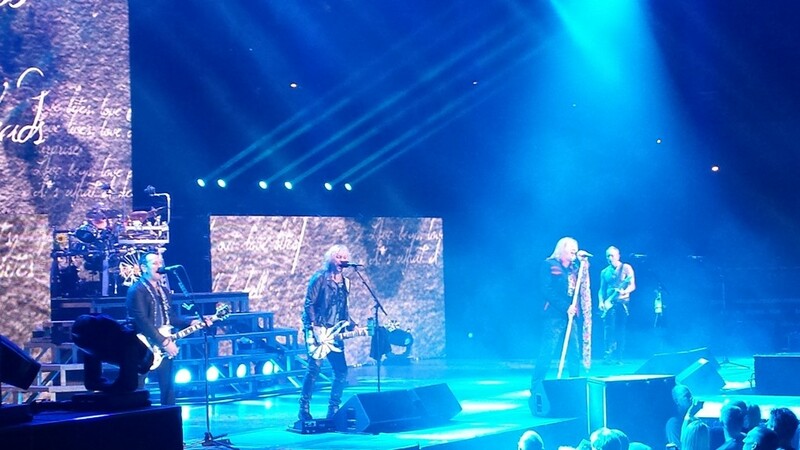 The current lineup of the band has been together since 1992, when Vivian Campbell replaced long-time guitarist Steve Clark after his death, and the other four members have been together since the early '80s. That kind of consistency in the ranks makes this version of Def Leppard incredibly tight on stage, where each of them has ample opportunities to shine over the course of their shows. Wednesday, 57-year-old guitarist Phil Collen scampered around shirtless, sporting a six-pack just as he did as a 25-year-old and ripping out solos on nearly every tune. Campbell, a veteran of Dio and Whitesnake before joining the Def Leppard ranks, played well alongside Collen, melding gjuitar lines here and there, and taking on solos of his own and those penned by his predecessor Clark as well. And the three longest-standing members of the band all shined, too. Bassist Rick Savage and drummer Rick Allen locked in early and kept the bottom end booming behind the band's guitars all night, and lead singer Joe Elliott showed he has little problem hitting the notes of the band's deep catalog of songs. 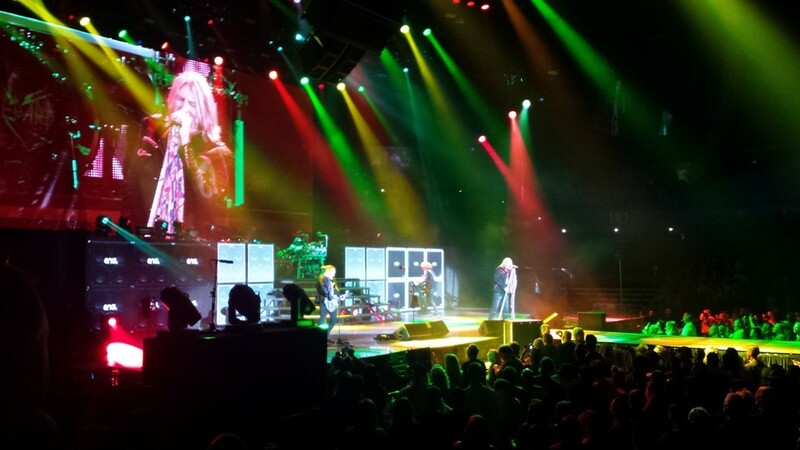 Def Leppard hit the stage with purpose, cranking through "Rock Rock (Till You Drop)," "Animal" "Let It Go" and "Foolin'" before anyone in the crowd could even take a breath — four huge songs in the band's career, all delivered with nary a word beyond the lyrics. A catwalk jutting into the crowd on the arena floor got the band closer to its fans. Three screens showing the action on stage so the folks in the back of the arena could see were among the few production bells and whistles; for the most part, the show was just the band on a sparsely decorated stage, kicking out classic songs, with perhaps a few lasers flashing in the background. Not many hard-rock bands feature four guys harmonizing together, but Def Leppard's vocal abilities help them stand out, and make already-huge-sounding songs come through all the more massive. "Paper Sun" from the band's 1999 album Euphoria was a bit unexpected early in the set, but served as a reminder that the band has continued making albums semi-consistently since radio trends moved away from their style of hard rock; they have a new one coming this fall, although that wasn't represented during the set Wednesday. Instead, after "Paper Sun," it was pretty much non-stop massive hits that had the crowd on its feet throughout, screaming along with the band: "Love Bites," "Armageddon It," "Rock On," a solo Joe Elliott acoustic take on "Two Steps Behind," performed on a catwalk jutting toward the middle of the arena floor. All told, the band delivered about 90 minutes of ear candy, all of it a vivid reminder of why these guys went head to head with Michael Jackson's Thriller at the top of the Billboard charts when they first broke through in America, and eventually sold more than 100 million albums worldwide — an absurd number back in the '80s, and an impossible one in the current music scene. They ran through "Rocket," "Bringing on the Heartbreak," "Hysteria," "Pour Some Sugar On Me," "Rock of Ages" and "Photograph" before it was all over and the crowd departed to the chilled night air outside the arena. 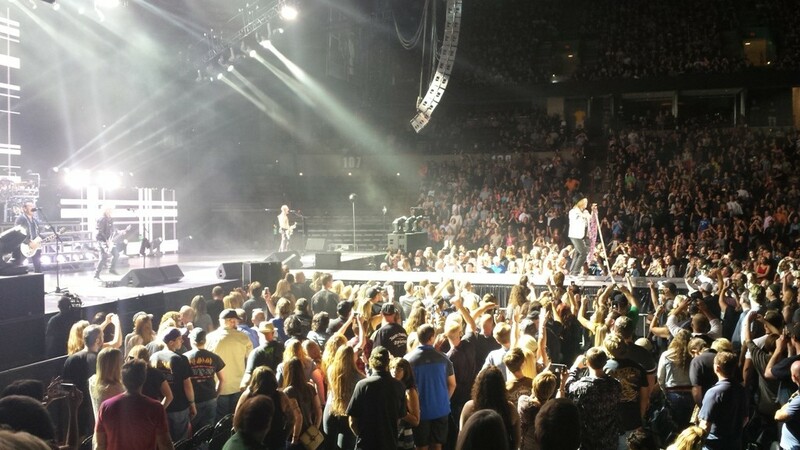 Def Leppard was clearly and deservedly the headliner, but both openers certainly had fans thrilled to find them in Spokane. Styx was sort of the oddball of the bill, given their more poppy and prog-rock inclinations than the other two bands, but they got a lot of love from the audience as they ran through songs like "The Grand Illusion," "Too Much Time On My Hands," "Lady" and "Come Sail Away" during their hour on stage. Kicking things off a few minutes before the announced 7 pm start time was Tesla, and the Sacramento crew remains a gem, albeit an under-appreciated one. They were unfairly lumped in to the "hair-metal" scene back in the '80s, but their songs like "Hang Tough" and "Heaven's Trail (No Way Out)" have a complexity not many of the hair bands on the Sunset Strip could match. Wednesday night, both those songs sounded great, as did "Love Song," "Little Suzi" and the band's acoustic-driven hit cover of "Signs."